I don't usually publish recipes here, but in this case, I think it's the best way to show you the type of recipes you'll find in this book. I know that when a lot of folks think of diabetic recipes, they first think about what they'll miss, or they expect that the recipes will be dull or uninspired. But, hey, if I didn't know that this was a diabetic cookbook, I might not realize it. You might think that you wouldn't find any pasta recipes, but ... they're there. Using whole wheat pasta. Another pasta recipe - and the one I have bookmarked to make next - is actually spaghetti squash. Okay, it's not pasta, but it's good stuff. The one I have bookmarked has shrimp, lemon juice, olive oil, garlic, and tomatoes, among other things. Doesn't that sound good? What's different about this book is that each recipe includes a wine suggestion that goes with each dish. I think that's a great idea. For those of us who don't drink a lot of wine, it's nice to get suggestions for what to serve. Overall, it's a nice book, particularly for folks who are diabetic, particularly if they love Italian food. Besides the wine suggestions, each recipe has what are labeled "Italian Living Tradition" as well as nutritional information. There aren't a ton of photos in this book, and they're all in two sections rather than being next to the recipes. Design-wise, it's not the prettiest book you'll ever see, but the information and the recipes look solid. All of the bodies of water that border Italy—from the Adriatic to the Ionian, Mediterranean, and Tyrrhenian seas—contain multiple varieties of shrimp, making shrimp popular everywhere. If you’ve never prepared shrimp before, you’ll be amazed at how easy it is. In my seafood cooking classes, I often tell students that, if they’ve had bad luck making shrimp in the past, it’s because they’re doing too much, not too little. The key to preparing good shrimp is choosing the freshest shrimp possible and cooking them until just done—not a second longer. 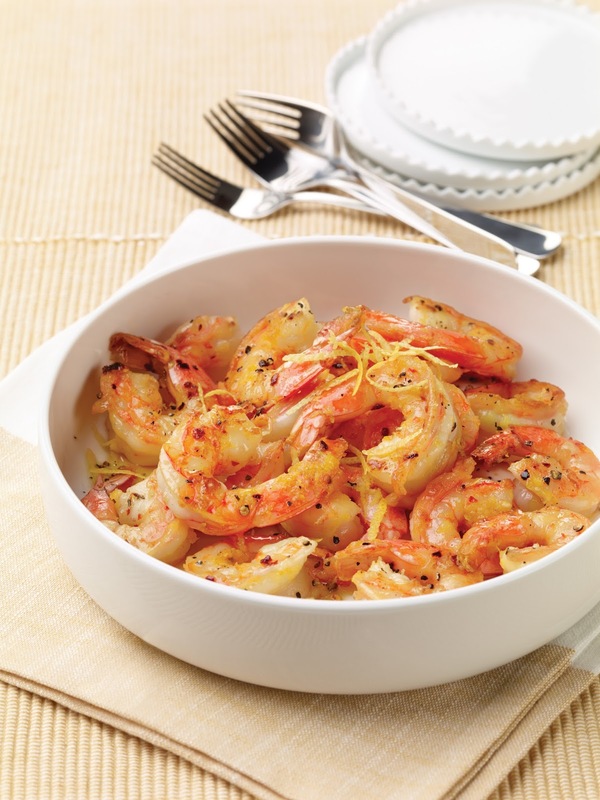 Baby, regular, and jumbo shrimp all work in this recipe, so feel free to use whatever is freshest. 2. When olive oil begins to release its aroma, add shrimp, salt, black pepper, and crushed red chile flakes. Cook shrimp on one side just until the tail of the shrimp is bright pink, approximately 1-2 minutes. 3. Turn shrimp over and squeeze lemon juice over top. Cook shrimp until all gray color is gone and they are pink and cooked through, approximately 1-2 more minutes. At this point, shrimp should be coiled slightly tighter than when they were raw. Shrimp will continue to sizzle in the pan. 4. When they are cooked completely through, transfer shrimp to a serving platter, garnish with lemon zest, and serve immediately. In addition to serving this as an appetizer, you can toss these shrimp into pasta with fresh parsley or add into a finished soup or salad. They also taste great on top of the Crostini with Chickpea Cream. Recipe copyright © 2016 American Diabetes Association. From The Italian Diabetes Cookbook. Photography: Renée Comet Photography. Reprinted with permission from The American Diabetes Association. The Italian Diabetes Cookbook is available at ShopDiabetes.org, in bookstores nationwide, or by calling 1-800-232-6733.